So this week it was Monkeys appointment with the Optometrist at Specsavers in Newcastle. An Optometrist was previously known as a Ophthalmic Optician, but apparently they changed the name as it sounded more clinical, the member of staff advised me this, however all these different names confuse me to be honest but there you have it. We had to be at our appointment 45 minutes earlier to give his eye drops time to work. On arrival we were greeted by a member of staff who took us to a booth and booked us in. The service was excellent and Monkey thought the man was awesome because he got a sweet. The drops were given to enable the Optometrist to evaluate in better detail the level of vision in his lazy eye. They prevented Monkeys good eye trying to compensate for the other, making his sight a little fuzzy. He had the drops which only caused a little discomfort for a matter of seconds and he was fine. We thought a treat was much needed whilst we waited for them to take effect. 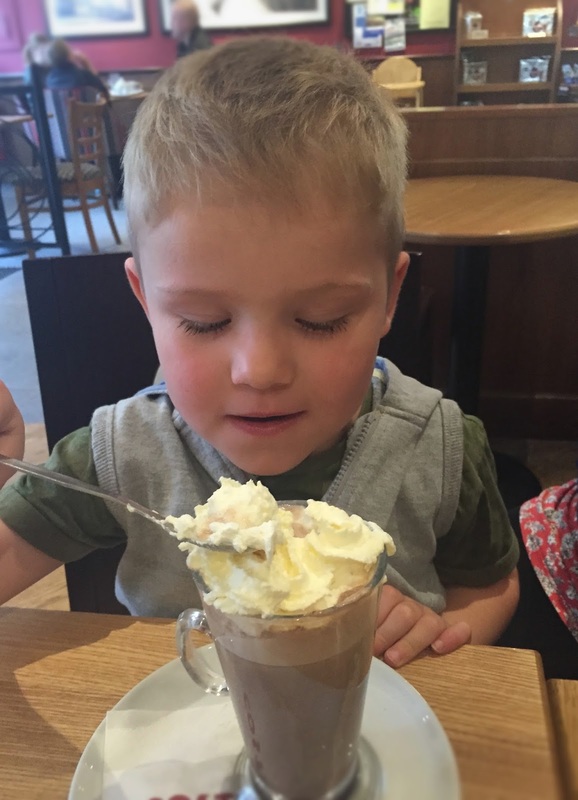 Well, who doesn’t like a Costa hot chocolate with cream and marshmallows? After 45 minutes Monkeys eyes had fully dilated and we made our way back for his eye examination. which entailed resting his chin on a little stand and staring into binocular like lenses for a matter of seconds. That measured how well his eyes focused. We were then led straight to the Optometrist. After different tests she confirmed that he would need glasses for now, although she seemed to think that it won’t be long term, he will be having a check up in around 4 months to see if there is any improvement. He doesn’t have to wear the eye patches at night as first thought by the hospital. The next bit was choosing some glasses. He was very impressed they had Disney Pixar Cars as one of the designs!. So we finally chose two pairs. Obviously never seeing Monkey with glasses before I thought they really suited him. He was more than happy with his choice. We were then took over to the fitting desk, where the lady fitted his frames and booked our appointment to pick them up early next week. The lady was really good with Monkey (he even went a little bashful). So that was Monkey’s experience with the Optometrist. He said it’s going to be cool wearing glasses because even Harry Potter wears them you know!. What Types Of Fostering Placements Are Available To You? Awww- what a cutie! It sounds like a proper adventure, I'd have definitely needed the hot chocolate. Sounds like everything's worked out and I hope the glasses help with his eye. Thank you :), it was very positive. Aww! Bless him! He was a little star!! It sounds like the whole experience went so well…..